In this article, I’ll share how you can adjust your Facebook tactics to make the most of news feed visibility today. Find out how to format updates to get you the most visibility in Facebook’s news feed. There are three ways to show a link you’re sharing on Facebook. Before I explain which format the Facebook algorithm likes best, let me take you through them. 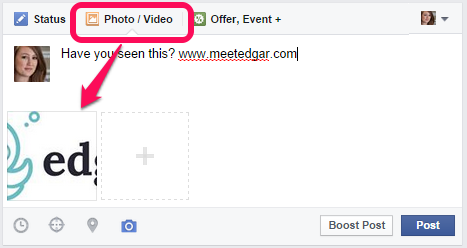 Copy and paste a link into a Facebook status update, and Facebook automatically generates a link preview. That preview includes a headline and a little blurb pulled from the destination URL, as well as an image pulled up from the link’s destination or one you upload. You can keep the link in your update text or delete it. 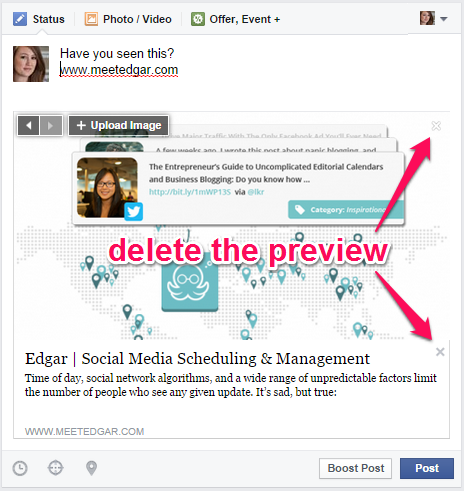 When you post a link onto your feed, Facebook automatically generates a preview. If you want, delete the preview, so your link is shared as a simple text URL. Just click on the “x” in the top right corner of the preview. To delete the link preview, just click on the “x” on the right-hand side. A final way to share a link is to upload a photo and include your URL in the caption. This way, it will also show up in your page’s photo album. Upload a photo to share along with your update, which includes the link via text. Facebook has been running tests to determine which of these three ways to share a link is favored by users. Once they discovered which type of link format their users click on most, Facebook decided to give that one better reach. The answer is the first one: use text and links with a preview to get the most visibility. Facebook announced that this type of link would be given more competitive reach than the other two. Remember, this is the default format when you add a link to a status update. 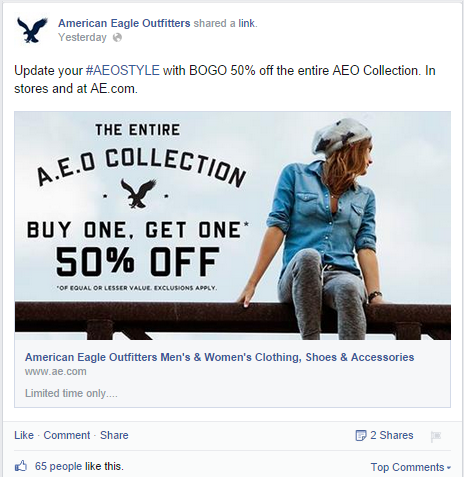 American Eagle shared the link to their website and then uploaded a photo to promote their sale to go along with the update. The link goes to the website, but American Eagle created and uploaded the image specifically for the update’s link preview. (The photo doesn’t even exist on the website.) The image promotes the offer, and is the perfect way to capture the attention of skimmers who may not stop to read text updates. Old Navy posted an image without a link. They know their customers can find them online. Old Navy’s approach is clever not because of what’s there, but because of what’s not. They posted a photo update without a URL in the caption. 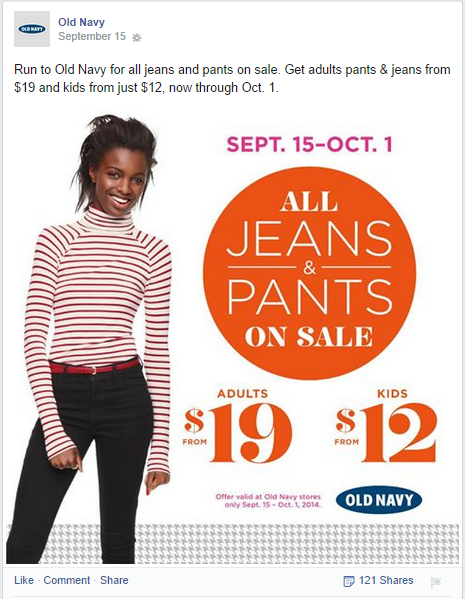 Old Navy’s update would not register as a link shared in a caption, because there is no link. Facebook recognizes this update as just another photo post. Presumably, Old Navy knows that any potential customers who see this photo update can surmise the store’s URL on their own. They bypassed having their reach reduced by opting not to include a clickable link in the caption. Bottom line: If you’re going to share a link, use a link preview. If you’re going to share a photo, don’t put a link in the caption. And don’t forget that you can upload your own custom image even if you’re using a link preview format. Facebook found that most users prefer a straightforward headline. The latter type of headline, which is really more tease than value, is commonly known as click-bait. Click-bait headlines have become increasingly popular for their ability to drive curiosity-based click-throughs. And, according to Facebook, users just don’t like them. That being the case, the social network is actively trying to discourage marketers and news organizations from courting clicks with these types of headlines. Facebook is looking at two key factors regarding links to external content to help determine whether a link may be click-bait: time spent at destination and user engagement. The network is monitoring how long users spend at the destination URL before returning to Facebook. The rationale is that if the content is valuable and worthy of greater organic reach, users will spend more time reading it. If the content isn’t valuable, or the link was only clicked in a fleeting moment of click-bait–influenced curiosity, it probably isn’t worth showing to many more people. 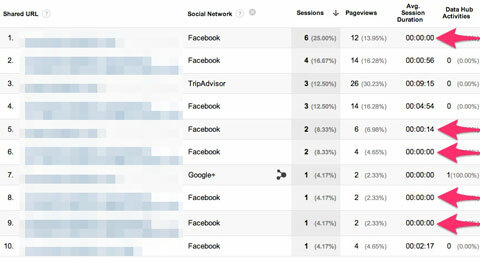 Use Google Analytics to find out for yourself how long Facebook users spend on your pages after they click through. These two examples, which show you what to do and what NOT to do, are both from Upworthy. Both updates link to the same video, hosted on different sites. This update has enough information for a reader to make an informed decision about whether to click. Between the update text and the link preview, the reader has sufficient information to decide whether he or she wants to click through to this emotionally charged PSA—presumably about domestic violence involving children. Note that this links to the website TakePart—not Upworthy. 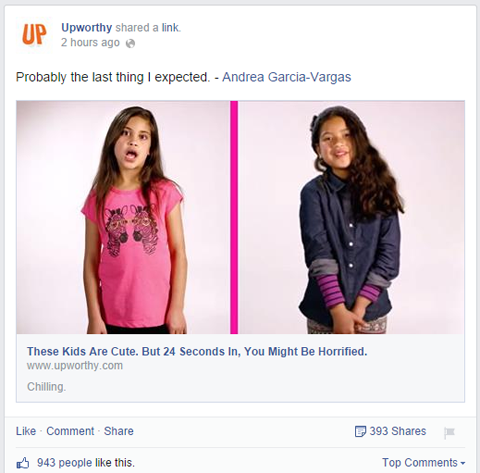 The next day, Upworthy hosted the video on their own site, and promoted it on Facebook again. Below is an example of the type of update you should not write. This update is engineered to withhold information from the user. It’s a video with cute children in which something shocking and/or horrifying happens. That’s all you know until you click. That may pique the reader’s curiosity enough to click through, but once they start watching and learn the nature of the video, they may not be compelled to stay on the site. The user doesn’t click because they’re genuinely interested in the video’s content; they click because they want to know the secret. The headline (“These Kids Are Cute. But 24 Seconds In, You Might Be Horrified”) is also troublesome. It can and will drive clicks, because it promises the user a very short time investment before they know the big secret; it will take less than 30 seconds. However, this is exactly the type of behavior that may raise red flags with Facebook and restrict your reach. 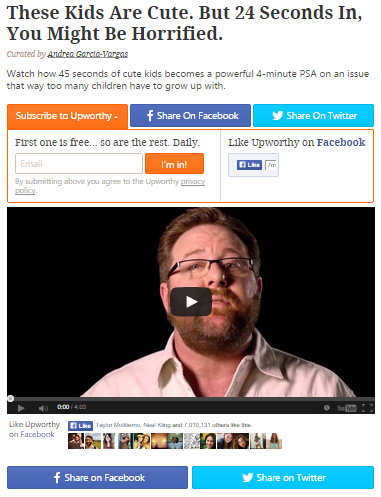 This update links to the same video, but on Upworthy’s site. It purposely withholds information, making it click-bait. If most users are spending less than 30 seconds at the destination URL, the network may identify it as low-value content. If this happens regularly, Facebook may determine that not just that link, but the Facebook page itself, is of low value, and consequently lower its average reach over time. Avoiding click-bait headlines may mean a lower initial click-through rate. However, the click-throughs you get will be motivated by genuine interest, not superficial curiosity. As far as Facebook reach goes, you’re better off with a lower number of users who take the time to digest your content than you are with a higher number of users who quickly come and go. Bottom Line: Don’t try to trick your readers. Explain what they’ll see and link only to high-value content. One popular strategy is even if you want people to click the link and read the article, drive as much of your engagement to Facebook as you can. 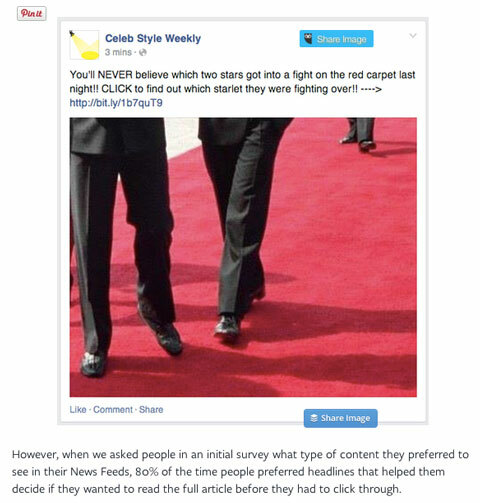 The comments are intentionally left off the post on the site, so the reader must return to Facebook to comment. Upworthy does not offer a comments section for content like this. Any user who watches the video and wants to comment has no choice but to return to Facebook and do it there. 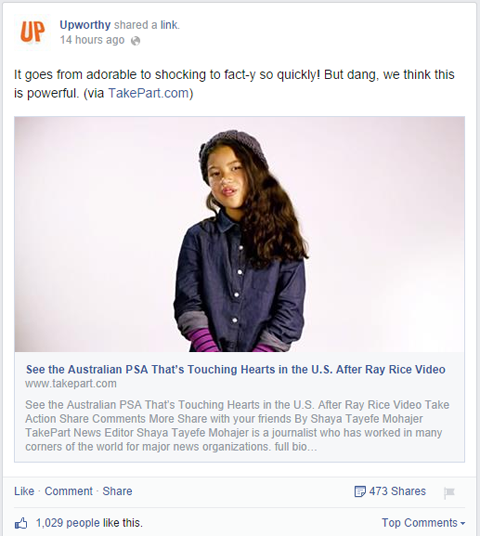 Upworthy also makes it remarkably easy to share (and see more of) its content on Facebook. You’ll notice that while there is no comments section, there are four different calls to action surrounding the video both above and below. There are places where users can click to either like Upworthy on Facebook or share the video they’re currently watching. It’s virtually impossible to miss; encourage viewers to engage on Facebook, which is exactly what Facebook wants and rewards. This doesn’t mean you necessarily have to take the same approach. Find a way to offer both options. 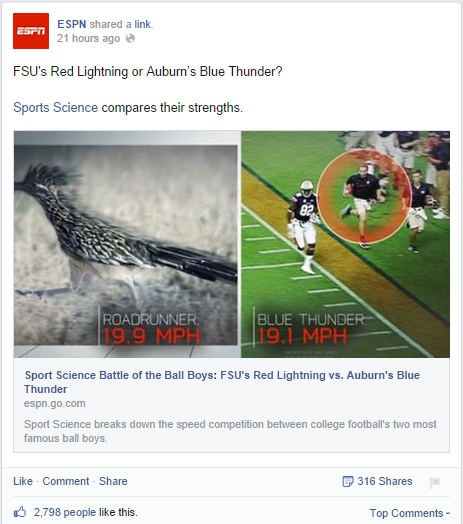 ESPN encourages comments on both the website and the Facebook page. Those who do click through will find a comments section on the ESPN website. Those who don’t and want to register an opinion about the two teams in question can do so right on Facebook. By encouraging that type of discussion, ESPN can actually improve its engagement rate on a shared link without necessarily driving visitors to the URL. Bottom Line: Whether you encourage engagement on your own site, you need to foster it on Facebook. This will help the network recognize the value of the content you share, and may help ensure that your content is seen by more people, both now and in the future. Facebook’s recent algorithm change can really help a brand or business. By identifying what types of link updates Facebook likes (and what is discouraged), it’s easy to incorporate them into your Facebook strategy. Share this sort of content in a way that the social network will recognize and reward. The result: more reach, more engagement and ultimately happier clients. What do you think? 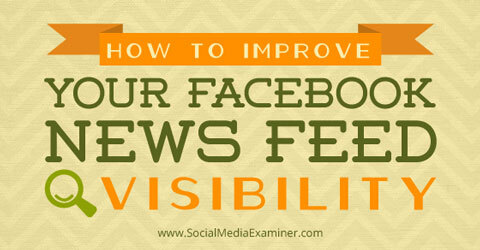 Have you been having challenges with Facebook news feed visibility? 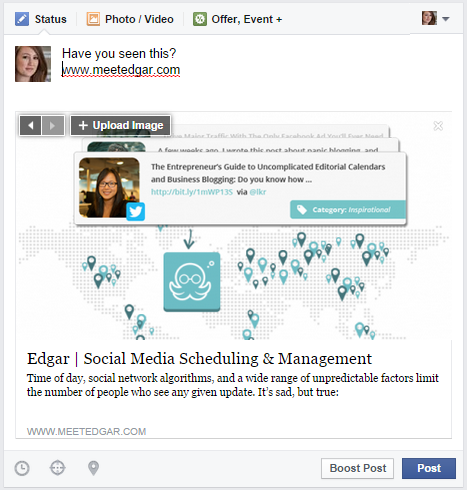 Have you figured out how to make the new Facebook algorithm work for you and your brand? What URL format gets the best engagement? Share your thoughts in the comments below.